Save some Cash! This Paintball Gun is used and has been tested to be in working condition. It may have some light scratches or cosmetic blemishes but this does not affect the operation. This used paintball gun comes with a 14 day warranty from the date of arrival. All used equipment is tested when purchased before shipping to be in working condition. Please note: it is impossible to keep inventory "live" and up to date instantly. We do our very best to update the website on Used Equipment frequently and quickly. Since used equipment is sold in store as well, there is a rare chance that something may be sold in store roughly the same time as an order is placed online. If you are concerned about stock status, please feel free to contact us at 847-437-7400 to check on Used Gear Stock before placing an order. 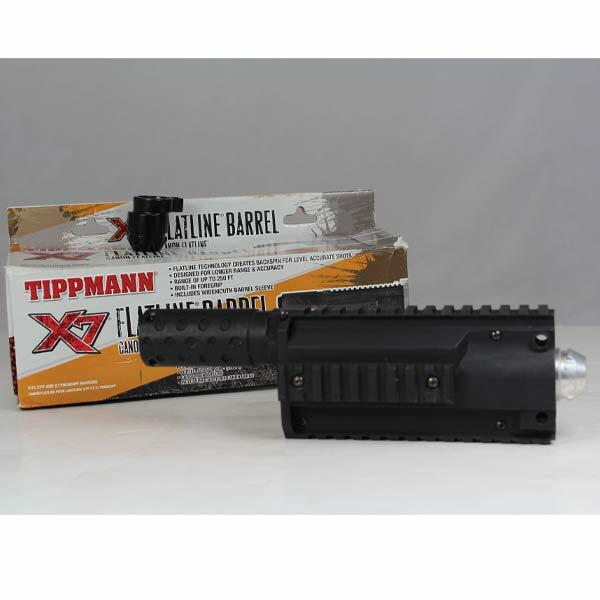 The new X7 Flatline is a top of the line barrel upgrade that can shoot up to 250 feet. Patented technology creates back spin on the paintball for long and accurate shots. This new look Flatline is integrated into the marker and isa great add on accessory.